Heat broiler to high. Line a broiler-safe baking sheet with foil. Set wedges on top of foil. Top each wedge with a square of cheese. Broil until cheese is melted, browned and bubbly, about 5 to 8 minutes. Sprinkle fresh snipped sage leaves and thyme leaves on top of wedges. Serve warm. Here’s something you may not know: Watermelon with broiled cheese on top is THE BUSINESS. I don’t blame you for not knowing this sooner. 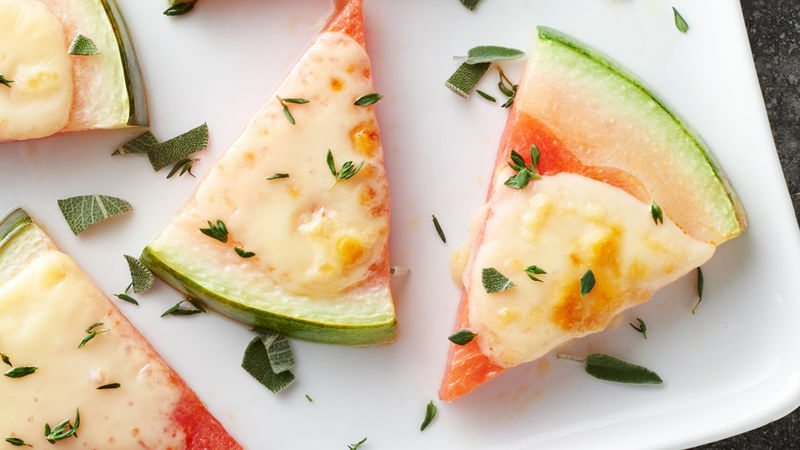 I didn’t know until the magical land of Pinterest whisked me away and I happened upon a recipe from the blog palate/palette/plate where you put melty cheese on top of watermelon wedges and call it an appetizer. And that is how Watermelon-Fontina Melts came to be. I assure you, this is one of the greatest discoveries of my summer (besides OxiClean and that one song by Robin Thicke). I’ve already eaten many (manymanymany) of these for snacktime, but I plan to make more for appetizers, dessert, a side dish, a potluck dish, and a just-because-I’m-hungry thing, because they take like two seconds to put together. Oh, and yesterday was National Watermelon Day, so that’s an even better excuse to make them. Happy day! First, heat the broiler. Cut a watermelon into wedges and place about a dozen of them on a foil-lined baking sheet. Top each wedge with a generous chunk of fontina cheese. Here’s my rule of thumb: Mo’ cheese is mo’ betta. Place the cheese-topped watermelon under the broiler until the cheese is melted and browned and bubbly, like so. Gah, that melty goodness gets me every time. Finally, sprinkle each wedge with fresh sage and thyme, then serve. You might want to be prepared to make at least a thousand of these in one sitting, because trust me – they go FAST. Watermelon-fontina goodness, get in my face! Stephanie (aka Girl Versus Dough) gives this melty cheese goodness a gold star. Check out Stephanie’s Tablespoon member profile and keep checking back for her own personal recipes on Tablespoon!